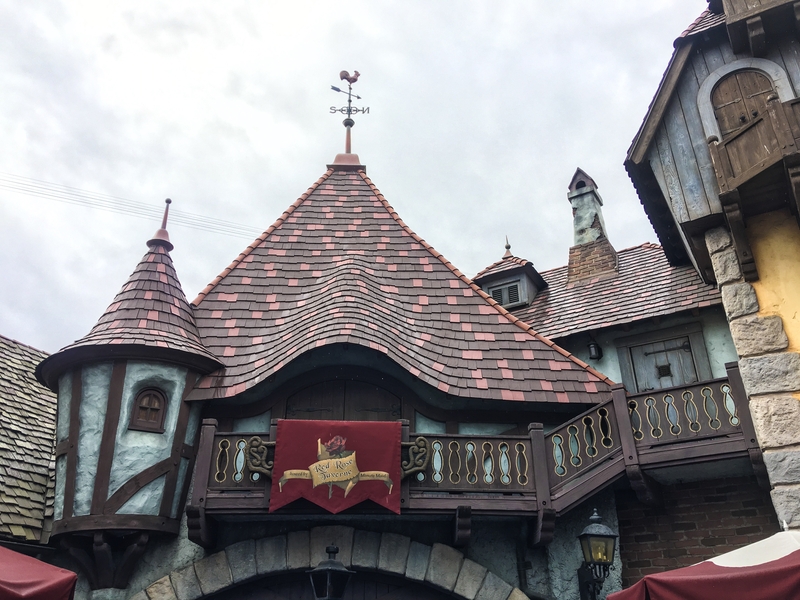 With Disney’s live action Beauty and the Beast film premiere just around the corner, Disneyland is celebrating in French style by converting Pinocchio’s Village Haus into Belle’s Red Rose Taverne. The restaurant is a complete makeover filled with Gaston influenced steins, Beast-ly burgers, and of course the Grey Stuff! 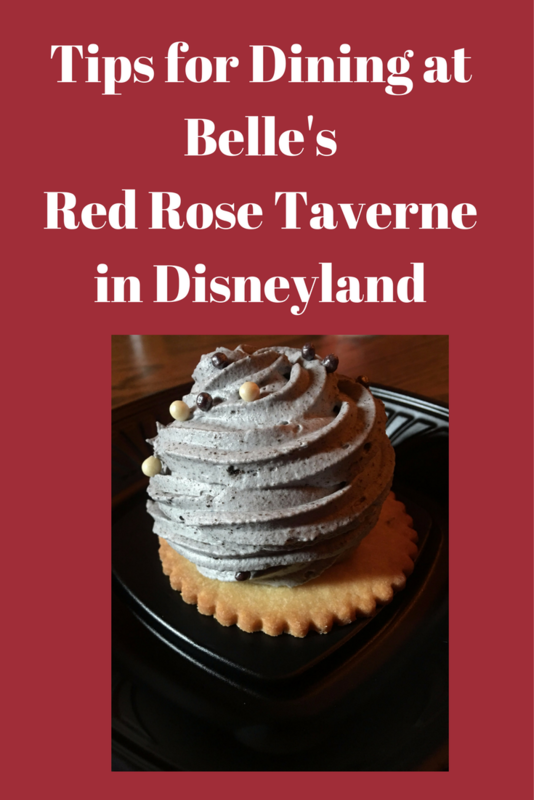 Due to popularity, the Red Rose Taverne is crowded most hours. You may have to stand in a long line to get in right at opening. A benefit of getting there early however, is that you get first pick of the merchandise, as it depletes significantly throughout the day. On the day I went, they had sold out of the Rose Cups and Steins within the first 15 minutes of opening, and then a couple of menu items within an hour. If you are there just to try some new goodies take your time, there may be a crowd but it is worth it to get your fill of the eatery. 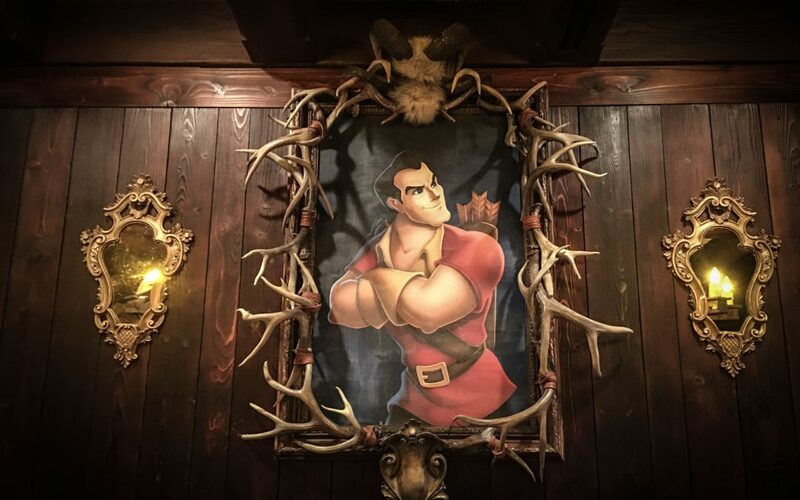 Gaston in all his glory. There are two places to sit at the restaurant: inside and outside. The more exciting choice is to sit inside because of the warm décor and atmosphere. You can eat at large wooden tables with art from the movies hanging on the walls. 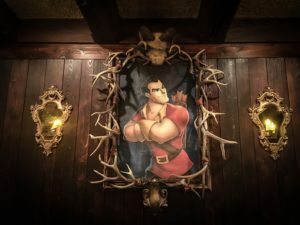 There is an ornate portrait of Gaston surrounded by antlers and a china cabinet complete with Chip and Mrs. Potts. On the day I went, it was raining so everyone was trying to eat inside. I had a strategy that worked out well for my family though. DIVA TIP: Send one person in your party out of the line to hunt down a seating area for everyone. I ended up taking someone’s table as they were leaving and held down the fort for about 10 minutes until my mom came over with the food and drinks. Now let’s talk food! The menu covers a lot of different food types: burgers, chicken sandwiches, salads, flatbreads, even a cauliflower sandwich, and of course desserts. My Mom and I ended up trying the Beast’s Burger (13.49), an angus patty topped with gruyere, caramelized onions, lettuce, tomato, horseradish aioli, and slow cooked beef. It was not as greasy as your typical fast food burger which was nice. 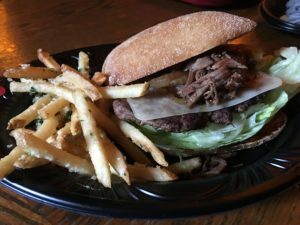 The meatiness was well balanced with the subtlety of the gruyere and the toasty bun is just a bonus for your taste buds. Overall, a very tasty dish! 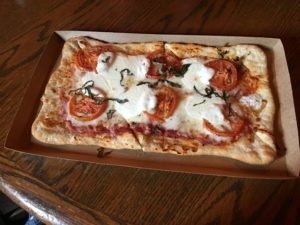 We also tried the Garden Mozzarella Flatbread (8.99) which was a pizza with marinated tomatoes, and fresh basil and mozzarella cheese. This dish was simple and delicious. Not much can go wrong with this flatbread. I mean you get a little marinara, some fresh veggies and oozes of cheese – what’s not to like? I think the flatbread can cater to a wide variety of audiences as well. It doesn’t have a strong intense flavor so it will be loved by kids, it is meatless so it will be tried out by vegetarians and such, and it’s lighter so those who are health conscious will enjoy it as well. We couldn’t wait to also try the Pommes Frites! Like the ones found in New Orleans Square at the Café Orleans (without dipping sauce) these garlicky fries are to die for. 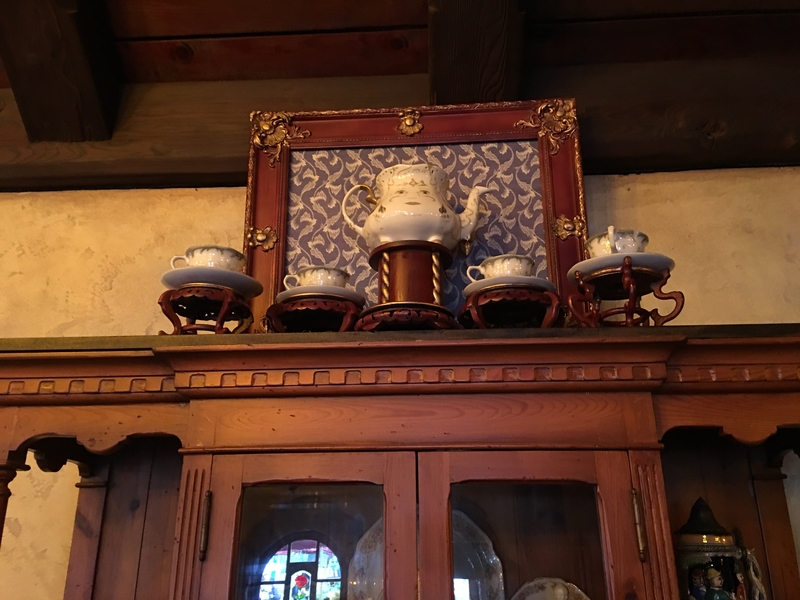 They are the perfect side to a meal or a yummy snack before heading out into the parks again. And finally, we HAD to try the Grey Stuff! 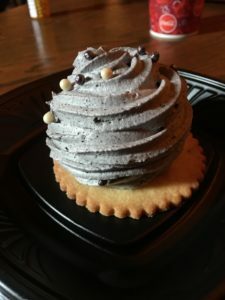 Having never had the opportunity to dine at the Be Our Guest Restaurant in Walt Disney World (read about it here) we were super excited to see just how delicious the Grey Stuff Gateau (5.49) really was. To start off it is super just to look at. This cupcake, covered in decadent grey stuff (frosting) and adorned with chocolate pearls sits atop a lemon shortbread cookie that is altogether as pretty as a picture. Inside is a luscious red velvet cake with an intense raspberry filling. 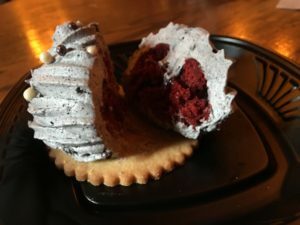 The dense cake goes nicely with the creamy frosting on top and when you add in the lemon-iness of the cookie all the flavors meld into a concoction that is tasty on your tongue! 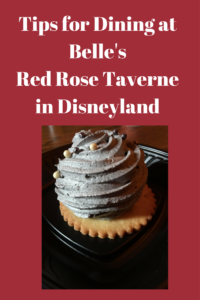 So now that you know of some of the offerings that the Red Rose Taverne supplies, come and check it out the next time you’re in Disneyland. 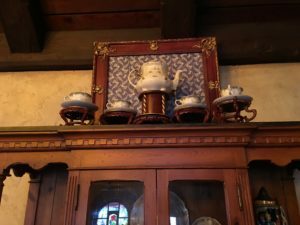 Sit inside beneath the wooden chandeliers, dine on French’s finest, and who knows, you might notice something there that wasn’t there before. Ready to book your next vacation? 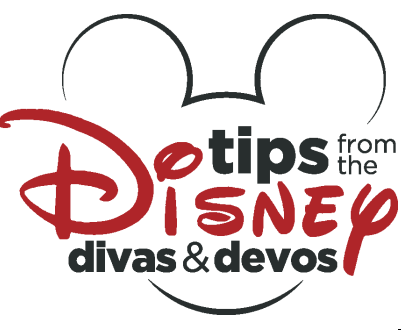 Contact our Authorized Disney Vacation Planner, Patricia at All for Dreams Travel for FREE HELP planning your trip and making all of your reservations. Just click here for a free quote! Disney Lover! 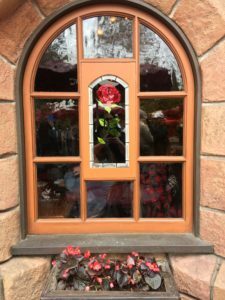 I love to visit Disneyland, collect Disney pins, blog for Disney Divas, take pictures at Disneyland, and fit Disney idealism into my everyday life. My partner in crime is my mom and we have been a Disney Duo for over 4 years. Walt Disney has become one of my heroes and I am motivated to learn and be more like him in my life. "All our dreams can come true, if we have the courage to pursue them." My Disney Dream is to work for the Mouse and I am moving in that direction every day.